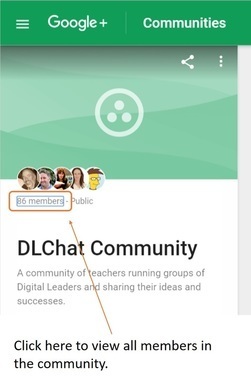 ​By far the simplest way to become connected on Google+ is to follow other educators. 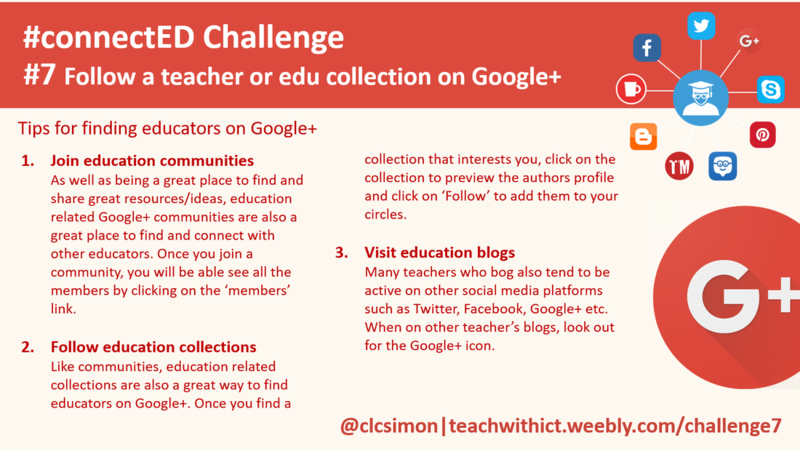 Education communities – As well as being a great place to find and share great resources/ideas, education related Google+ communities are also a great place to find and connect with other educators (See challenge 2). Once you join a community, you will be able see all the members by clicking on the ‘members’ link. Education collections – Like communities, education related collections are also a great way to find educators on Google+. Once you find a collection that interests you, click on the collection to preview the authors profile and click on ‘Follow’ to add them to your circles. Education blogs – Many teachers who bog also tend to be active on other social media platforms such as Twitter, Facebook, Google+ etc. When on other teacher’s blogs, look out for the Google+ icon. Edu communities are great places to find other educators! http://ictevangelist.com/beginners-guide-to-google-plus-for-teachers-the-crib-sheet/ - A beginner’s guide to Google+ for teachers courtesy of Mark Anderson (@ictevangelist).